Late in his life, Goya created a series of prints called the Disasters of War, which were not published until 35 years after his death. The series departs markedly from the heroic depictions of warfare that had traditionally been the subject of art. Instead, Goya focused on the devastation that ordinary people suffer as a result of conflict—a reality that Goya knew all too well, as he lived through a period of near-constant political upheaval and war. 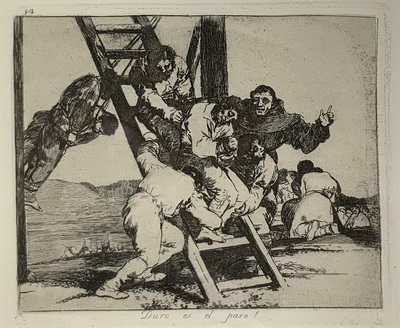 The composition of Duro es el Paso (plate 14 from Disasters of War) evokes images of the Crucifixion from Christian tradition, turning a depiction of an execution into a scene of martyrdom.